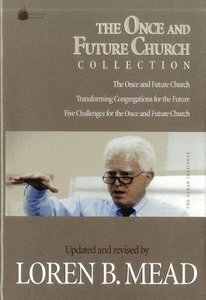 In 1991 The Once & Future Church by Alban Institute founder & former director Loren B. Mead created an instant sensation in congregational circles with its prophetic insights into the life of the church in a post-Christendom era. Still often-quoted & in demand, the book stands as Alban's all-time best seller. Two subsequent titles, Transforming Congregations for the Future & Five Challenges for the Once & Future Church, extended Mead's original vision with similar success. Now, to celebrate the tenth anniversary of the publication of The Once & Future Church, Alban is proud to release all three of these books as a single, special edition--our first hardcover book ever! In addition to these classic texts in beautiful, newly designed formats, this Collection features an interview with Loren Mead discussing how his views have changed since the books' first publications & his current thoughts on directions for the church in the 21st century. This hardcover volume is the perfect gift for graduating seminary students, new congregational leaders, or for pastors whose original editions of these three books may be dog-eared or missing--and a wonderful addition to every church library. All who love the church & pray for the future of our congregations will value this opportunity to have Loren Mead's seminal works in a single, long-lived edition. About "The Once and Future Church Collection"